Click here to follow all the live action between NorthEast United FC and Bengaluru FC. Preview: In-form NorthEast United FC (NEUFC) will look to break Bengaluru FC's dominance and close the gap at the top of the table when the two sides clash in an Indian Super League (ISL) game at the Indira Gandhi Athletic Stadium on Wednesday. Bengaluru have been the best team in the league so far, remaining unbeaten in eight matches, winning seven of them, including six on the trot. But they will still be on their guard as they are challenged by the next best side in the league, who are placed second and have 18 points from nine matches. NorthEast coach Eelco Schattorie will be highly motivated to end Bengaluru's unbeaten run. The home side have not exactly been in red-hot form this season, particularly at home. They have registered a single win in their four matches on home soil but coach Eelco Schattorie will hope they can get a positive result as they attempt to break the 20-point mark at the start of the second leg. "I think Bengaluru have an advantage here (because of the fixtures). But they don't have their best player (Miku) available, so I think that's a disadvantage. But they have shown that they can win games even without him. They have conceded just six goals so far so breaking them open will be difficult," said Schattorie. Bengaluru have maintained a 100 percent record on the road, winning each of their four away games. 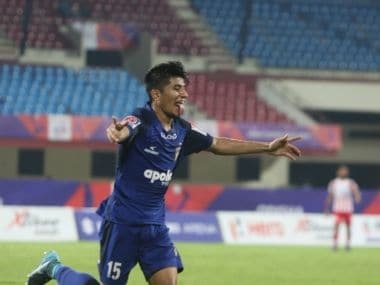 Despite the continued absence of Miku, who has been a vital cog in their team, the likes of Sunil Chhetri, Udanta Singh and others have stepped up to the challenge. Bengaluru coach Carles Cuadrat will be pleased with the collective effort of his squad in front of goal. Players such as Rahul Bheke and Nishu Kumar have contributed with a goal or two as Bengaluru continue their march into the play-offs. "NorthEast United FC have done really well this season. From all their games that I've watched this season, I can see that there's a lot of work going on behind the scenes. They've been working hard and you can also see that they have done well with their scouting. They've brought in some good players and you can see that the club is growing," said Cuadrat. Bengaluru have looked susceptible to pressure outside their fortress as they have conceded at least a goal in their last three away games. Schattorie would have done his homework and now it's over to his boys to do the needful.